Springboks winger Bryan Habana has promised a much-improved defensive display from his side when they tackle the British & Irish Lions in their crucial second Test clash in Pretoria on Saturday. South Africa's renowned watertight defence was repeatedly breached by the Lions during a thrilling match at King Park in Durban last Saturday - leaking a total of three tries - but the hosts managed to hold on for a narrow 26-21 triumph. The Springboks had been in command of the game before a number of substitutions appeared to break their rhythm and the Lions' centre pairing of Jamie Roberts and Brian O'Driscoll proceeded to scythe through the South African line seemingly at will. 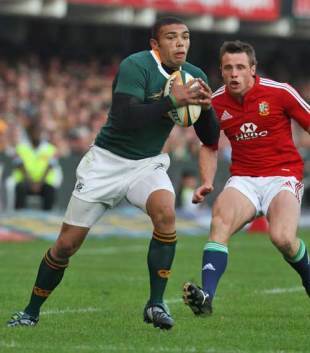 However, Habana insists that only minor changes to the Springboks' defensive patterns will be required this weekend. "I don't think there was much wrong with our defensive system," said the 2007 IRB Player of the Year. "I think there were a couple of times where we made wrong decisions as individuals, myself included. And that posed a big question for us in defence where we had to scramble a lot for each other. I think we respected their backs and that goes without saying, we knew it was going to be a tough task. "That said, we give ourselves goals and set ourselves certain standards. As backs, maybe we let ourselves down a little bit, putting a little extra pressure on ourselves. But like I said, what happened on Saturday was done and dusted there. There were mistakes and as a team we will try and rectify them in this coming week." The narrow win in Durban drew criticism from the home fans but Habana, who makes his 48th appearance for the Springboks on Saturday, insists that all that really mattered was that they came away with a victory. "We'll take the win, whether it was by five points, one point or by 50. The first Test was always going to be vitally important. We're professionals and when you get selected to play for the Springboks, no matter where you play, you've got to take responsibility and I definitely feel that we have the calibre of players at the moment to take that responsibility." By his own high standards Habana, who has 32 Test tries to his name, had a quiet game going forward in the opening Test but the Bulls' speedster revealed that he was happy with his own contribution. "I think when you play Test match rugby and especially when you only have a series every 12 years against the Lions, the most important factor is that you make a contribution towards a successful team. I think defensively, I was really happy with where I was on Saturday. Like I say, whether I'm scoring tries or making turnover tackles, I think that's quite important. "It's always nice to score tries, but I think when you've got a series as massively important as this one, then just winning is probably the most important thing. It wasn't very nice not getting onto the scoreboard, but the contribution that each and every player made for that 80 minutes was vitally important, whether it was on attack or defence." Saturday's Test will be staged at Habana's home ground, Loftus Versfeld, where the Bulls recently claimed the Super 14 crown and the 26-year-old is relishing the prospect of playing in front of what is guaranteed to be a vociferous set of fans. "Loftus has been really great for me and I really love playing there. It's a special place," he said. "Hopefully we can craft some more opportunities than we did in Durban, because what you saw there wasn't an accurate reflection of our attacking capabilities."